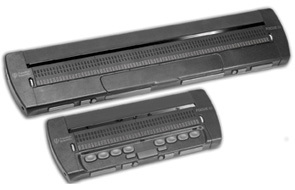 The Focus 80 Braille Display has the latest in braille display technology. It puts you in control as you smoothly navigate the Windows® environment. Based on features rated most desirable by braille display users, Focus Braille Displays are packed with advanced features and options that can be easily configured through JAWS®. The new design eliminates seams between the braille cells, making the display feel like paper! The convenient location of navigation keys, bars and buttons promotes comfort and more economical hand movement. Exclusive Whiz Wheels® let you scroll by line, sentence, or paragraph, or pan through a document. Front panel select buttons can be used i(n combination with panning buttons, rocker bars, and cursor router keys to select a block of text, page up or down, or move to the beginning or end of a document. 10 dual-purpose hot keys centered behind the cursor routers give instant access to many braille and JAWS commands. Use these to enable Contracted Braille, switch to display modes such as structured and line mode, or perform keyboard commands like TAB, SHIFT + TAB, HOME and END. Take advantage of the Focus Perkins style keyboard to issue navigation, Windows, and JAWS commands without removing your hands from the display. Rapid Reading Mode configures the display to use only 20 cells of braille for faster reading with minimal hand movement. VariBraille allows you to select the firmness of the braille display. Comes with a carrying case and a keyboard stand/handle. 24-month warranty against manufacturing defects from date of receipt.